The holiday season is officially here and we, home cooks, are getting ready to put our oven mitts on for some serious cooking! Store bought stuffing is good but nothing beats a homemade one. This vegan stuffing is healthy, savory, nutty and packed with freshly chopped herbs. It’s so yummy, your guests will be asking for seconds! Thanksgiving is almost here and we are so excited to celebrate this year! You see, every year we and the same group of friends take turns hosting Thanksgiving dinner. This year, Ben and I will be welcoming them to our humble abode in Brooklyn. We have a fun and diverse menu that’s sure to delight all of our guests! I love preparing Thanksgiving classics in my home kitchen! It’s fun to get up early, blast some music and sharpen my knives. Because many in our group of friends have dietary restrictions and preferences, I focused on creating a menu that everyone can enjoy without having to worry too much about the preparation. To give you an idea, the only dish containing meat is the turkey breast, and the only dish with dairy is Ben’s famous green bean casserole. 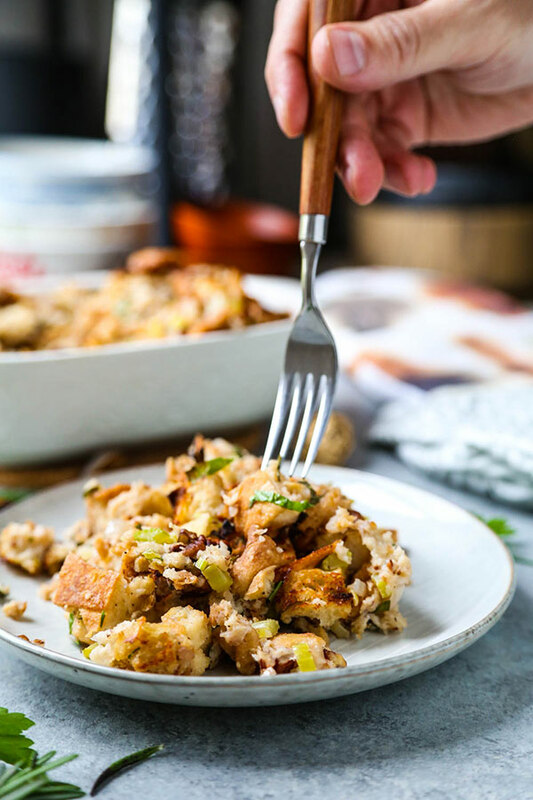 Everything else – including this savory vegetarian stuffing – is plant based. And I can promise you that it will be just as delicious as a traditional Thanksgiving dinner! Here’s the deal about plant based dishes – they really aren’t that different from meat based ones. You can inject hearty flavors into a classic dish in a number of easy ways. It’s only when it comes to dairy that the taste can greatly vary. For example, I won’t even pretend to liking vegan cheese. It just doesn’t taste the same. Therefore, since Thanksgiving is about hearty and comforting food with familiar flavors, Ben is keeping his green bean casserole classic style, with cream of mushroom soup and 100% real cheese. However, he’ll also be making a vegan slow cooker green bean casserole, so everyone around the table can get in on that savory, umami green bean goodness! 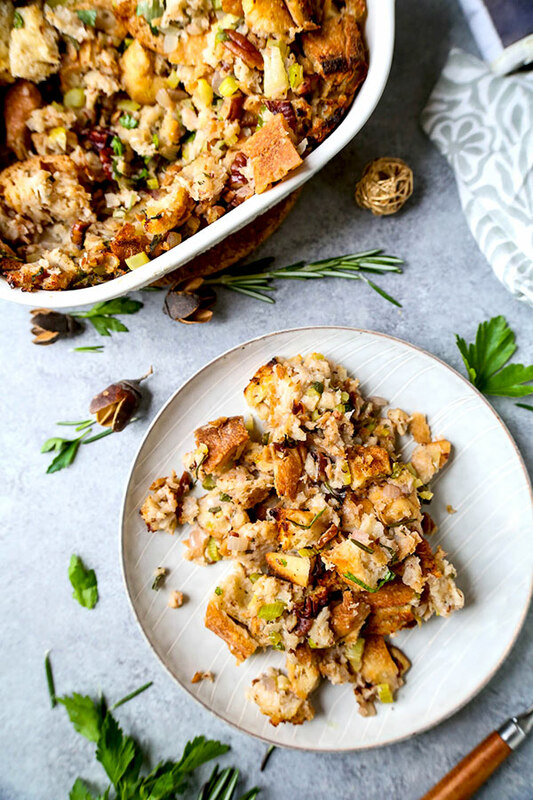 So, my guess is… when it comes to this vegan stuffing, your meat loving guests won’t be able to tell the difference! While it’s healthier than classic stuffing (the use of vegetable broth and olive oil means it’s lower in saturated fats), the taste and texture are exactly the same as a chicken broth and butter based stuffing. This recipe is a win win for the health conscious! Let’s get this out of the way… I grew up eating boxed stuffing. And I loved it. It has the iconic flavors of Thanksgiving and Christmas dinner, all rolled into one. 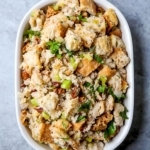 So, the main hurdle when making a vegan stuffing recipe is replicating that rich flavor, without the advantage of succulent ingredients like butter and chicken broth – or binders like egg. Use vegetable broth instead of chicken broth. Easy, savory, done. Go for extra virgin olive oil instead of butter. Instead of using an egg as a binder for your dressing, make a flaxseed egg from ground flaxseed and water (more on that in a second). Luckily, that covers our bases as far as this vegetarian stuffing is concerned. The rest is pretty much the same. Ingredients like sage, rosemary, celery and parsley power the herby side of things just like in a classic stuffing recipe. So, without further ado, let’s cook! 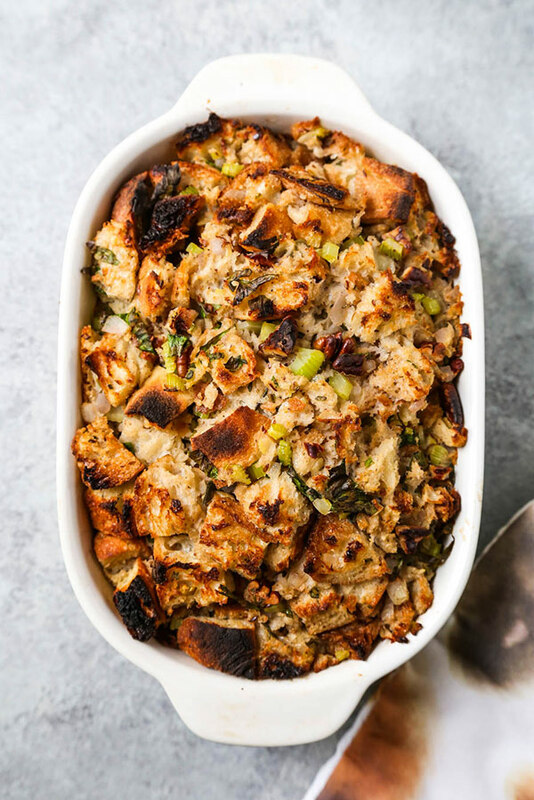 This easy vegan stuffing is moist, fragrant, savory and even a little crunchy! That’s because I’ve kept the crust on the bread cubes to make the texture a little more interesting. All you’ll need is white bread such a fresh baguette or ciabatta, cut into cubes. To dry the bread cubes, you can either leave them in a bowl overnight or bake them in the oven for 20-30 minutes at 325ºF. 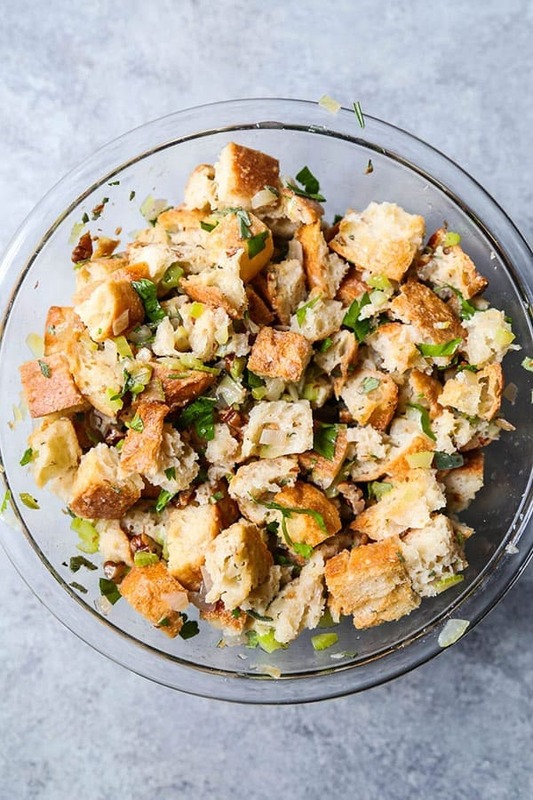 Once dry, toss the bread cubes with vegetable broth, olive oil, chopped onions and celery, pecans (or walnuts), some fresh herbs and a flaxseed egg. So, What is a flaxseed egg? A flaxseed egg is simply 1 tablespoon of ground flaxseed mixed with 2 1/2 tablespoons water. This helps bind ingredients in the same way an egg does. Season with plenty of salt and pepper (I use about 1/2 teaspoon salt) and transfer the mixture into a baking dish. The last step is to bake the stuffing for about 45 minutes, broil for 5, and serve. This easy vegetarian recipe will be popular with the vegans around your table – as well as the omnivores. 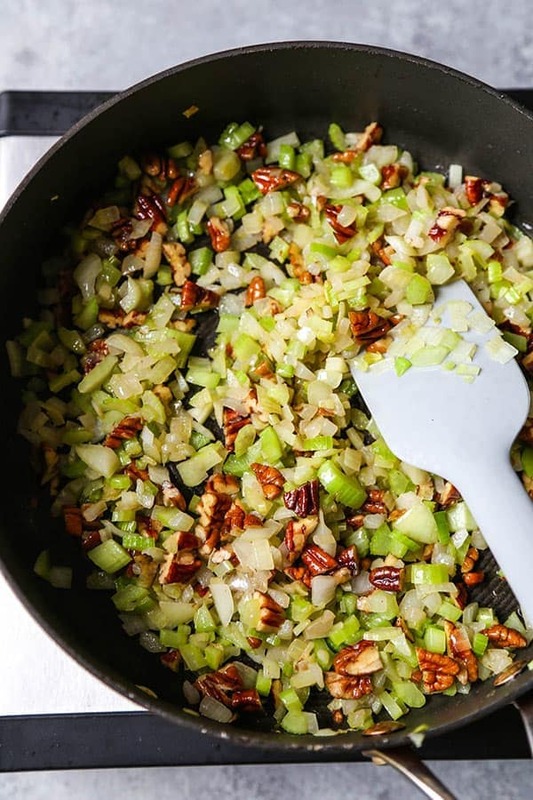 Watch your vegan stuffing disappear in minutes – the mix of fresh celery and herbs add so much depth of flavor, everyone will be asking for seconds! Now, you can make this vegan stuffing a day or two ahead of time, and store it in the fridge. To reheat, place the stuffing in a baking dish and reheat on low (280ºF), for 30-40 minutes. Of course, the texture is best when it’s fresh. 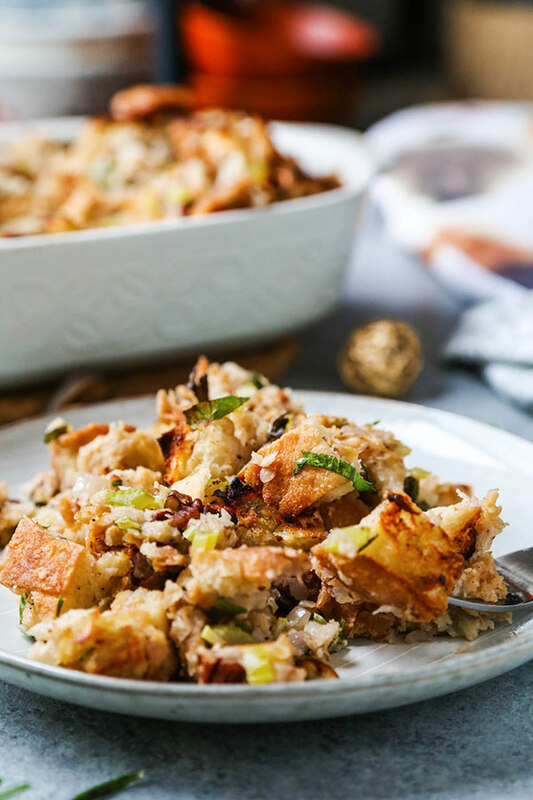 So making this easy homemade stuffing on the same day as your big holiday feast is recommended. 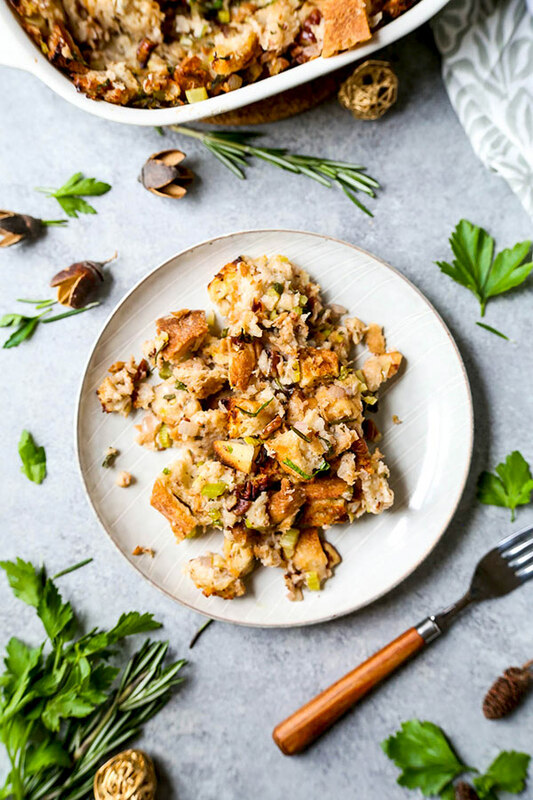 Is this vegan stuffing the best stuffing recipe for your family this Thanksgiving? Well, you’ll have to give it a shot and find out. I’d love to hear what you think if you try it! I do have a feeling though… Now that you know how simple it can be to have homemade stuffing at your holiday dinner table, you will never go back to store bought! 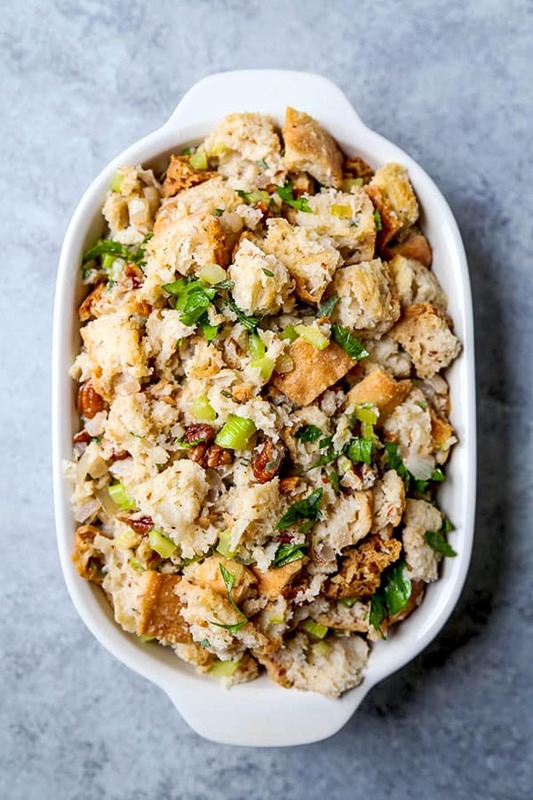 Did you like this Easy Vegan Stuffing Recipe? Are there changes you made that you would like to share? Share your tips and recommendations in the comments section below! 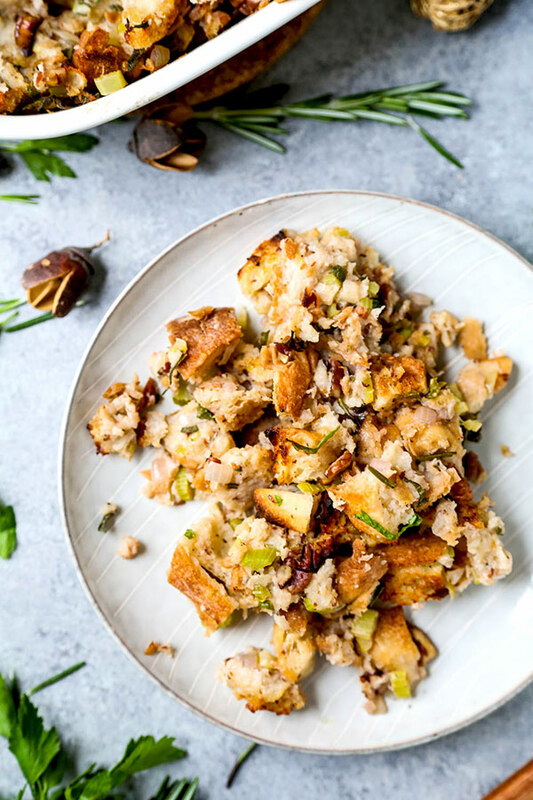 A healthy and festive vegan stuffing recipe that meat eaters will also enjoy! Place bread cubes in a bowl or a tray and leave overnight to dry. Place bread cubes on a cooking tray and bake in the oven at 325ºF for 30 minutes, or until bread cubes are dry and slightly colored. 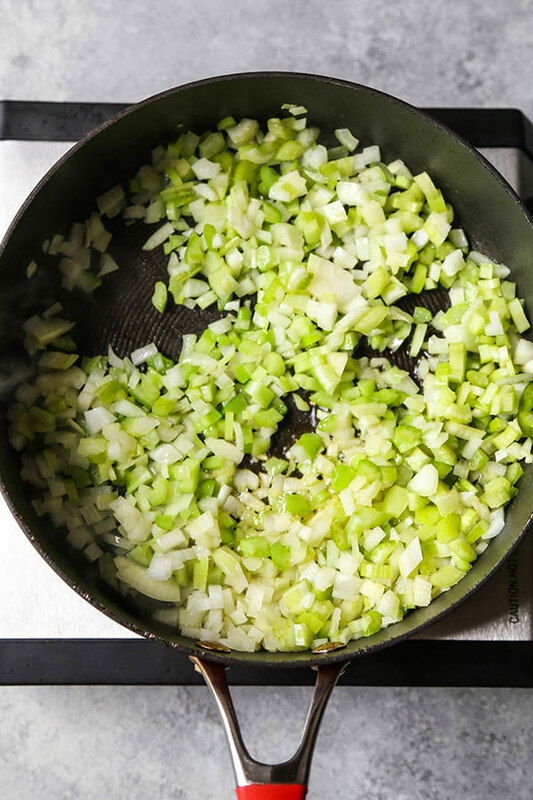 In a pan over medium heat, add olive oil, onions and celery and sauté for 4-5 minutes, until onions are translucent. Add walnuts (or pecans) and sauté for an additional 3 minutes. Turn the heat off and transfer to a large bowl. Add bread cubes and vegetable broth and gently toss. Add flaxseed egg, sage, parsley and rosemary and gently fold. Season with salt and pepper and transfer mixture to baking dish. Turn oven to broil, remove foil and bake for an additional 5-7 minutes, or until the top is golden brown. Serve. This vegan stuffing recipe will keep in the fridge for up to a week. Hi Pickled plum any other kind of vegetables to substitute celery? Thank you! Hi Siew, leeks would make a wonderful substitute for celery!